A promising taste of more to come? 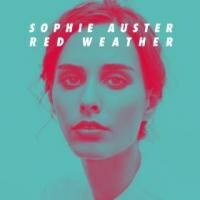 Sophie Auster's six-song Red Weather EP contains some lively tunes and solid songwriting. It's unlikely to leave anyone openmouthed with its lyrical audacity or instrumental virtuosity, but then again it doesn't aim to. It's an accomplished, if brief, set of pop songs, one which promises more from this performer in the future. Auster may be trying to resurrect a career here -- she released an album per year from 2005 to 2007 before dropping out of the public eye. If this EP is any indication, she's still got something left in the tank that might endear her to fans of sultry-voiced, emotionally expressive women singers. The album runs only 26 minutes, but manages to incorporate a number of different moods and styles, cleverly bracketed by "Run Run Run" and closer "Back to Me", with its chorus of "You'll come running back to me, come running back". "Run Run Run" is a strong opener, with Auster's mournful-but-defiant vocals floating over a bed of keyboards and jittery percussion. "Back to Me" is a downtempo number that closes the proceedings on a somber note. Auster doesn't have the biggest voice in the world, but she uses what she's got with skill, crooning and moaning her way through these tunes without the need for any American Idol-style belting. The rest of the set covers diverse ground, from the jangly indie-rock guitars and snare-drum stomping of "Wicked Word" to the nervous shuffle of "Square Moon" to the intrspective moodiness of "Lonely". Throughout it all, Auster's voice remains the focus, which is for the most part fine. Her voice is hardly going to fill Carnegie Hall, but these songs don't ask her to. "Pretend" hangs its pretty melody on a bit of strummed acoustic guitar and violin, but manages to sound understated rather than maudlin. This is low-key, rainy-Sunday-afternoon music, more suited to staring out the window than getting the housework done. Auster knows her way around a melody, and she imbues these tunes with an air of wistfulness and longing that conveys more feeling then the lyrics could manage on their own. That said, there is a certain evenness to the record as a whole. Should these songs make it onto a full-length release in the future, Auster might be well advised to mix up the performances with a few quicker, or louder, or angrier numbers -- something to suggest a range that is, at the moment, absent. So then: it's a little tough to render a verdict on such a relatively slight offering. Plenty of artists are releasing EPs these days, with anything from three to six songs on them, and it's not entirely clear why. Presumably the purpose is to generate excitement about an upcoming release, or else to test the critical and popular waters to see if such a release is worth pursuing. In Auster's case, the answer to this second point is clearly yes, but any interest in such an record is qualified by uncertainty as to whether the artist can step outside her comfort zone and deliver a full-length album that surprises as much as it should.